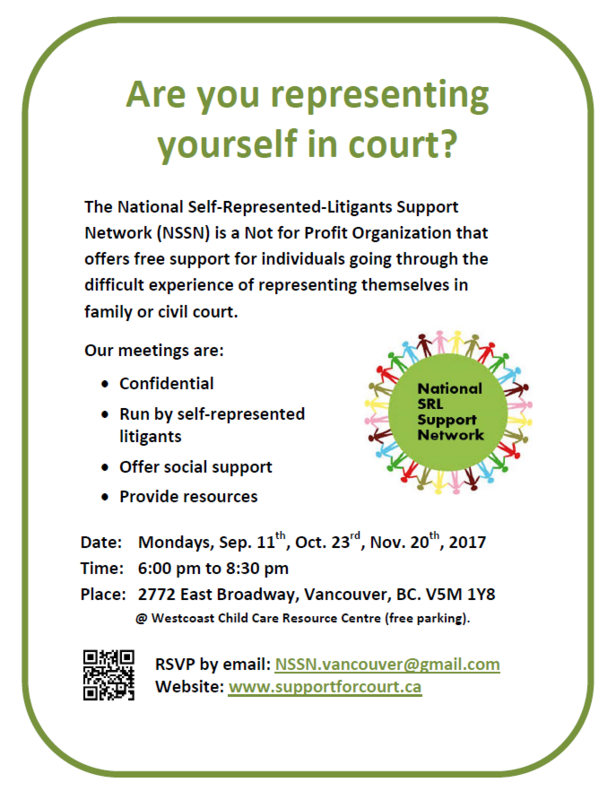 Monday, September 11 (6-8pm): NSSN SRL Support Group Meeting at 2772 East Broadway, Vancouver. Wednesday, September 13 (9:30am-12pm): The New Societies Act: What You Need to Know at 100 – 938 Howe Street, Vancouver. Monday, September 18 (5:30-7pm): Amici Curiae’s newest Workshop – VPL at Alma VanDusen Room, VPL Central Branch, Downtown Vancouver. 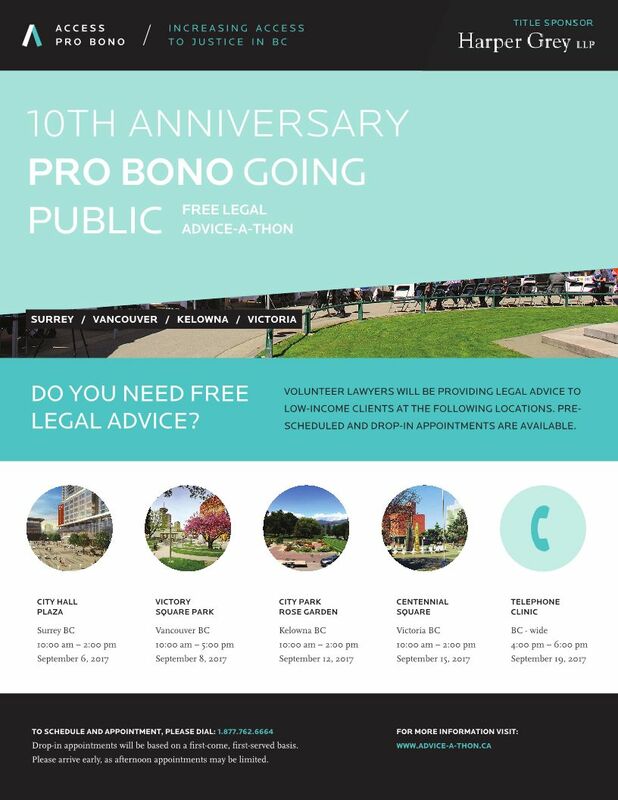 Amici Curiae is excited to announce it is launching a new legal forms workshop in partnership with the Vancouver Public Library. 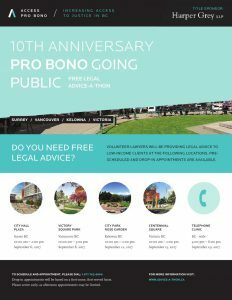 This new workshop will ultimately be at the centrally located Oakridge Branch and will offer assistance with legal forms, including in the areas of: BC Court of Appeals (civil and family law matters); Supreme Court of BC Civil and family law matters; Provincial Court of BC affidavits; BC Human Rights Tribunal applications; and employment, tenancy and foreclosure matters. Our free service is available to the public, including battered women, transgender persons, and Indigenous people. We will be hosting an information session and we invite you to come hear more about the services we will be offering at this new workshop. Please RSVP by e-mail to Yvonne Choi at YChoi@harrisco.com. Wednesday, September 20 (1-2:30pm): Nidus presentation at 1420 West 12th Avenue, Vancouver. Attend a free presentation conducted by a Nidus-trained volunteer. Learn about planning for incapacity and end-of-life. Find out how to book an appointment for personal help to make and register your planning documents. No registration required. Thursday, September 21 (8:30am-5pm): 2017 Info Summit at UBC Robson Square Theatre, Vancouver. Given the recent shift in the provincial political climate, we are pleased to announce that we are breaking away from the biennial tradition this year and will be hosting our 7th BC Information Summit on September 21, 2017 at UBC Robson Square. This is an important time in the information and privacy landscape. The change of political leadership in BC gives us the opportunity to bring much-needed attention to the major deficits in our access to information and privacy frameworks. Major changes are on the horizon in terms of the freedom of information systems at both the federal and provincial levels. Courts, committees and Commissioners have made major recommendations for change which would bring major changes to the system. This Conference has assembled a range of experts from varying backgrounds to look at these developments and what they might mean for information and privacy rights. 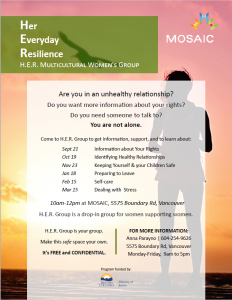 Thursday, September 21 (10am-12pm): Information About Your Rights (Her Everyday Resilience) at MOSAIC Boundary – 5575 Boundary Road, Vancouver. The “Her Everyday Resilience (H.E.R.) Multicultural Women’s Group” is a drop-in group that is held once a month from September to March (except December) for multicultural women who have experienced violence in relationships in their past or present. Hosted by MOSAIC’s Stopping the Violence Counselling and Multicultural Outreach Services, it’s free and confidential. 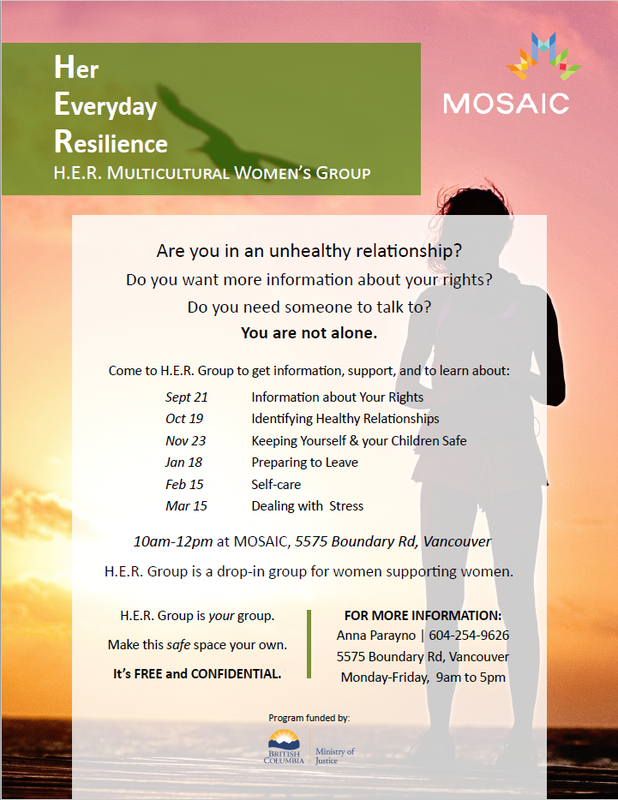 If you know a woman who may benefit from this group, please share this information with her and encourage her to call the Women’s Support Worker at 604-254-9626 ext. 1081. If a woman isn’t yet ready to do group work, the STV Counselling program and Multicultural Outreach Services can also provide individual counselling support and outreach for those who have experienced, or are at risk of, abuse, threats, violence in relationships, sexual assault, or childhood abuses. Register online. Friday, September 22 (3:30-6:30pm): AMSSA’s 40th Anniversary AGM in Creekside Community Centre, 1 Athletes Way, Vancouver. AMSSA is a unique province-wide association that strengthens over 70 member agencies as well as hundreds of community stakeholder agencies who serve immigrants and newcomers, and build culturally inclusive communities, with the knowledge, resources and support they need to fulfill their mandates. Celebrate their 40th anniversary. Register online. 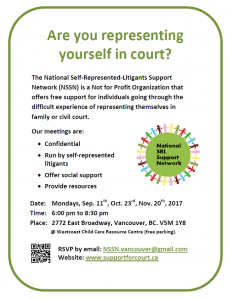 Monday, September 25 (5:30-8:30pm): Community Legal Assistance Society presents CLAS’ Annual General Meeting.